Liam Jurrah: guilty or victim of a botched process? The power of persuasion is at work in the Supreme Court in Alice Springs and the fate of Liam Jurrah hangs in the balance. When prosecutor Stephen Robson had marshaled all the Crown evidence against the accused and called for a guilty verdict, Liam Jurrah looked to the gallery, where family and friends were seated, and sighed. This is the first time in my observation that he has looked to the gallery and registered much of a reaction during the seven day long (to date) trial. At left: At the end of Day 7 of the trial, Bruce Hearn Mackinnon, author of The Liam Jurrah Story, says goodbye to the accused. Mr Robson had five eye witnesses, including Basil Jurrah, the alleged victim, saying that Liam Jurrah had hit Basil Jurrah with a machete. Three of the five said he hit Basil on the head with the machete; the other two, couldn’t say where he had hit him. Minor inconsistencies should not undermine the jury’s appreciation of a “solid core” of evidence against Liam Jurrah, argued Mr Robson. As in life, witnesses’ accounts will vary but on the important details there was consistency. There was also sufficient consistent evidence, he argued, from the family group gathered at House One that Liam Jurrah had been involved in a fight with Lemiah Woods. This evidence goes to the accused’s intentions when coming to Little Sisters in the first place, argued Mr Robson. It is contrary to what he told police in his interview and Mr Robson said it was open to the jury to find that he was lying about this as evidence of his consciousness of guilt. In response to the glowing testimony from character witnesses, he said they had shone a light only into parts of Liam Jurrah’s life, especially his professional football career. They couldn’t say much about his behaviour when consuming alcohol, he said. He also suggested that the witnesses in the case had known Liam Jurrah a lot better and for a lot longer that the character witnesses had. Mr Robson addressed the “tall poppy” argument put by defence counsel at the start of the case. He suggested to the jury that it was a “cultural nuance” associated with Europeans. He asked them to use their life experience to assess this argument, saying that he had not seen many instances of Indigenous people “wanting to cut down one of their own”. Mr Robson was calm, careful and thorough in his address and softly though clearly spoken. The voice of Jon Tippett QC as he began his summing up filled the courtroom and he didn’t shy away from passionate emphasis. He went immediately to character and said he didn’t have to rely on the testimony of character witnesses, when he could rely on what Liam Jurrah did on the night in question: he had helped an old man out, making sure that he was safe (this was the evidence of Murray Woods, the old man in question) and then had looked after the injured 14 year old. These two actions simply did not fit with being the same person who bashes a man with a machete. The man who was able to do display “decency and responsibility” on an occasion when no-one else was, was the same man who, never having offended before, sat in the police station, looked police officers in the eye and answered their questions: “There’s character!” said Mr Tippett. Liam Jurrah was “open” with them because he didn’t have anything to fear, as he hadn’t done anything wrong. He went on to describe the investigation by police as “appalling”. An investigation must be as capable of exonerating a person as incriminating them, he argued. Not only was there no crime scene established nor any real search for weapons, there was no medical evidence about what type of instrument could have caused the injuries sustained by Basil Jurrah. 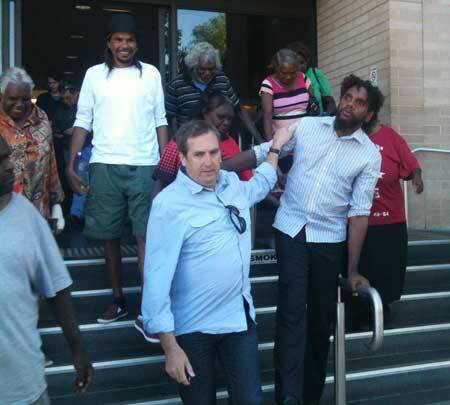 He inferred that the investigation was slack because it involved a fight on a town camp, a family situation between Aborigines, but the consequences for his client at “this end” are very serious. “How would you feel?” he asked the jury, if they or their family members had been the victim of such a process. He asked the jury to do the job for his client, as best they could, that had not been done by the investigation when it came to analysing the evidence. He said there were two victims of the events of the night of March 7 last year: Basil Jurrah who had been hurt badly and Liam Jurrah who was accused of something he did not do. The jury could ensure that there remained only one victim. Mr Tippett’s summing up will continue tomorrow.